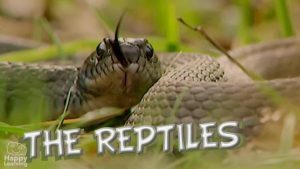 In this quiz for kids questions about the reptiles are done. You have to get a 100% to win. Reptiles are cold-blooded vertebrates. They have dry skin covered with scales or bony plates and usually lay soft-shelled eggs. Animals that are cold-blooded don’t automatically maintain a constant body temperature. They have to lay out in the sun to keep their body heat up. This also means that reptiles don’t burn as much energy keeping their body warm and, as a result, they don’t have to eat nearly as much food as a similar sized mammal or other warm-blooded animals. The reptiles are among the jewels of the evolution of the animal kingdom. Crocodiles have been around 250 million years ago and is one of the animals that still have strong resemblance to the dinosaurs. If you want to learn more about that funny animals, you can visit the reptiles section! Watch the video "The Reptiles"